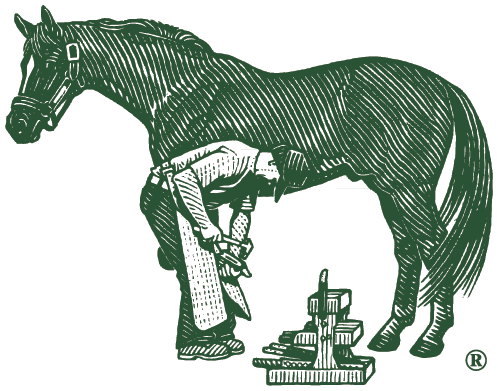 Feeding Farrier's Formula® to an older horse even though he does not have hoof problems has many benefits. One of the problems in feeding the aging horse is that mastication (chewing) of feed becomes less efficient; therefore, nutrient absorption of the feed is diminished. Also, the connective tissue including skin, hoof, bone, tendons, and muscle is not as strong and healthy as in younger horses. Another geriatric problem is that many times the metabolism, therefore activity, is usually slowed because of decreased levels of thyroid hormone (thyroxin). Farrier's Formula® addresses the above problems because it helps feed efficiency by improving digestion and by improving quality of the existing feed given to horses. It also improves the aging and weakened connective tissues by furnishing the nutrients necessary for building strong and healthy collagen. For many aging horses that are less active due to decreased amounts of thyroxin, Farrier's Formula® has iodine and the essential amino acid tyrosine, which are the necessary building blocks for the thyroid gland to manufacture thyroxin.